12.5 mm x 120 mm tongue and grooved V-board, the ledged and braced door is hung on three T-hinges, secured by a lock and key. 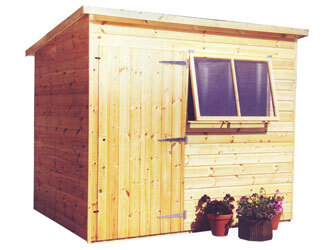 Deluxe Pent sheds are custom made with doors and windows configured to your needs at no extra cost. fittings & heavy-duty roofing felt. As standard, the Deluxe Pent is untreated. A variety of treatments is avaialble as an optional extra. Pent sheds are available with a choice of door and window positions (see below) please add the style you require to the shopping basket when ordering.